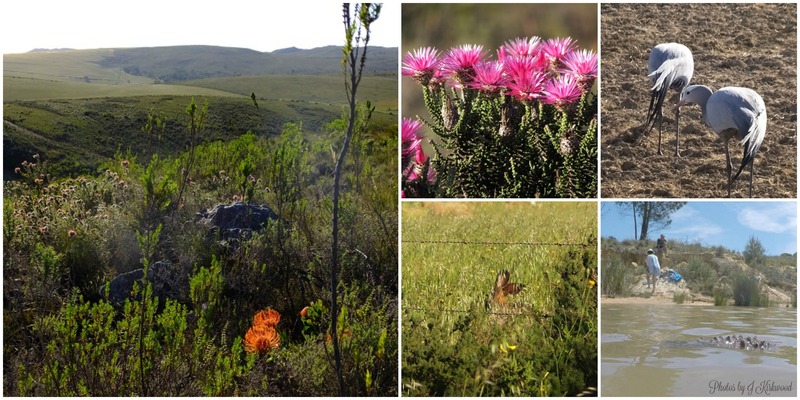 This time around we went to Eikebos which is between Caledon and Greyton. There is quite a long stretch of gravel road on the way to the campsite and for a short section it does go around a mountain (hill) with quite a huge (not that big) drop on the one side. I’m petrified of heights so I sat white knuckled for about 5 minutes while hubby drove and my child (eldest one) laughed at me. However, we made it through the terrifying experience (really wasn’t that bad) and pulled up to a stunning green grassed, tree lined camp site. We were met by the owner of the site and she ran through a few rules and showed us around. The one thing was the tents needed to be setup on the sandy patches as they were trying to keep the grass growing nicely and tents tend to kill grass. Don’t think they’re fond of each other for some reason. They have stunning ablution blocks and a nice big room you can use for functions, etc. The place is really well maintained and kept clean. They unfortunately don’t have a pool, but there is a small clay / mud dam just around the corner and if you have a 4×4 you can take a drive to a much bigger dam where you can swim (at your own risk). You could try the drive with a normal car, but I don’t think you will have any decent undercarriage or wheel alignment left by the time you get back. 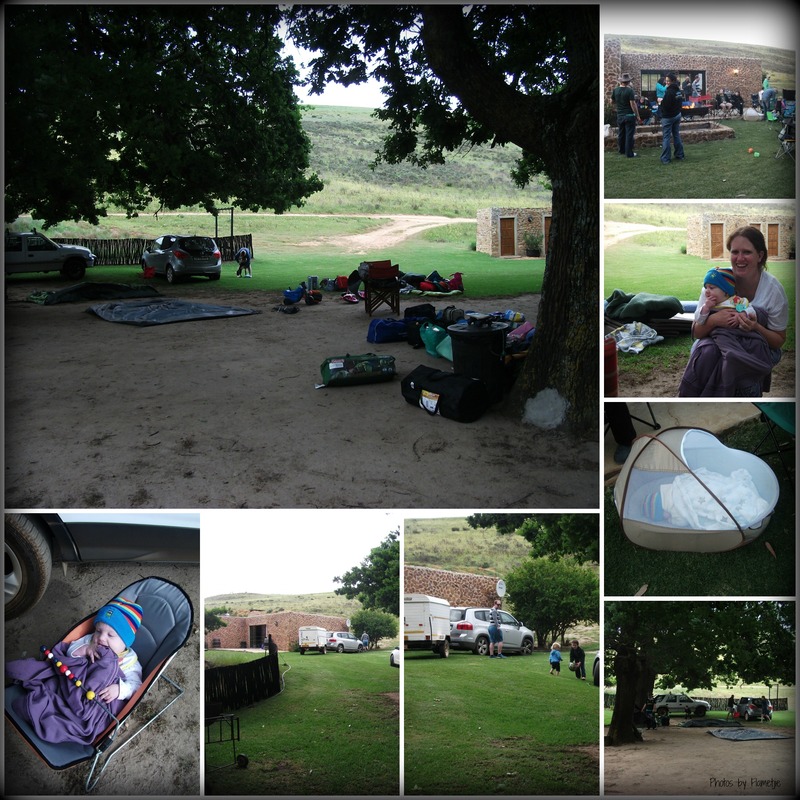 We arrived just after 15h00 on the Friday and it was unfortunately a bit windy and chilly so setting up the tents took a bit of team work. We eventually got everything up and then managed to chill for a bit in between feeding the kiddies and ourselves. The weather on Saturday was stunning and the kids had an absolute blast. The little ones had baby pools they could splash around in. The older kids had fun on the slip and slide and they also came with for a ride to the big dam. A few people went through to town and the rest just chilled. In the hall / room, they had a flat screen tv hooked up to a dstv decoder so Saturday afternoon we could watch the Currie Cup final (didn’t watch the whole game so didn’t even know Western Province lost. 😦 ) and then Saturday evening we all settled in to watch the Rugby World Cup Semi Final between South Africa and New Zealand. It was an interesting game to say the least and there was a lot of shouting happening at times, but I suppose we all have to admit that the All Blacks were the better team on the day. Unfortunately. Enough said. I do hope they’re the better team at the Final as well because I really do not want Australia to win. I would much rather prefer New Zealand to be the first country to win 3 world cups. For supper on Friday night we had a sausage and chicken braai and on Saturday night we had two different potjies, which was absolutely divine! After all the kids were in bed the adults sat around the camp fire chatting, telling stories and just having a good time before we slowly started moving off to bed ourselves. At about 02h00 Sunday morning hubby and I woke up with our heads being knocked by our tent. The wind had come up so badly that it was knocking the side of our tent almost flat onto the ground. It was so bad we honestly thought the tent would blow away. There was a lot of sand inside because of walking in and out and because of the crazy wind, it kept blowing around inside the tent so Logan had to climb into bed with us because he was being covered in sand. 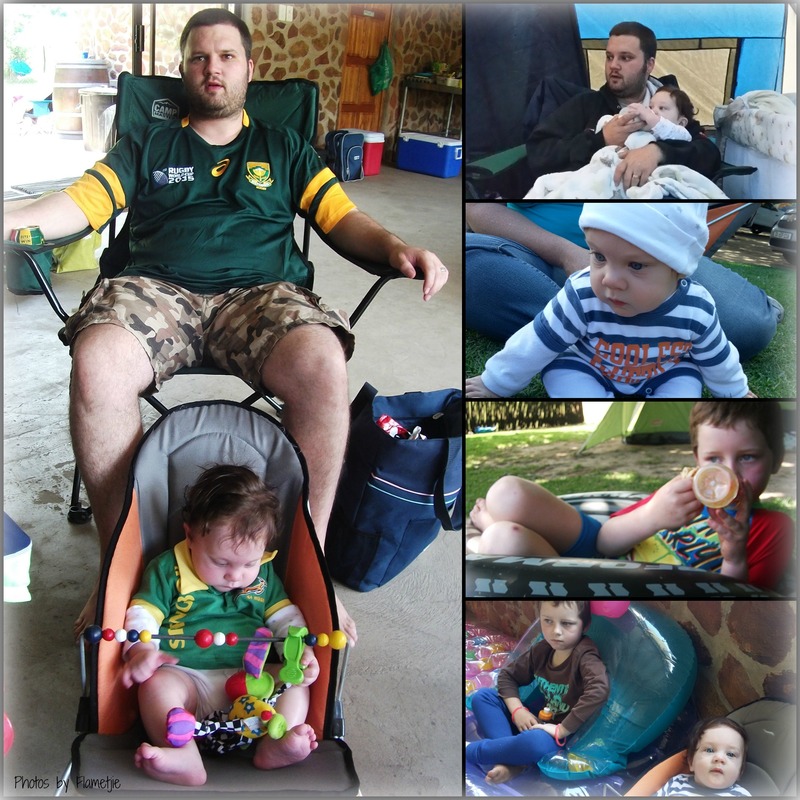 Nathan slept like a log in his camper cot and only woke up at about 04h30 (just as I was dozing off) to be fed. The wind was still howling at 04h45 when I had to go to the loo, but it must’ve stopped soon after that as it was a whole lot calmer at 06h00. One of the other families ended up sleeping in the room because their tent was so badly affected by the wind. It was seriously insane.